This is the third post in my series about my favorite architects from the golden days of architecture. We are going back to Scandinavian design again, allow me to introduce Arne Jacobsen, one of the forefathers of Danish Modernism and Functionalism. Born in Copenhagen 1902, educated at the Royal Danish Academy of Fine Arts, School of Architecture in Copenhagen and professor at the Academy between the years 1956-65. Jacobsen was both an architect and designer, his most famous works include The Ant chair, Model 3107 chair, The Egg chair, St Catherine’s College, University of Oxford, SAS Royal Hotel Copenhagen and Bellavista in Klampenborg. Personally, I admire the SAS Royal Hotel in Copenhagen, not only because it was Denmark’s first skyscraper but for its clean “International” design and the use of material. The hotel is located right next to the Tivoli (amusement park) and the Central Train station, which makes it a ideal place to stay if you visit Copenhagen. 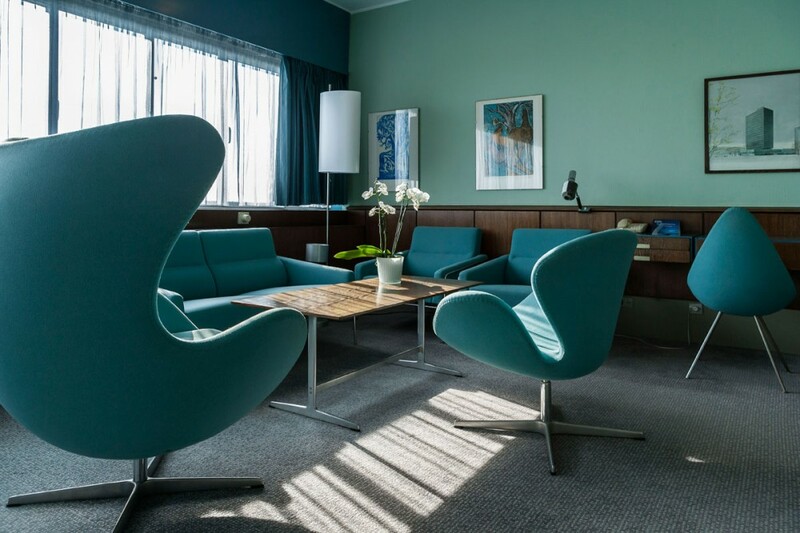 When the hotel was built in 1960 it had a separate check-in and waiting area for people traveling with SAS from the Copenhagen International Airport. Buses would wait outside to transport the passengers to the airport itself. The terminal was located at the ground floor of the hotel, next to the lobby and was built to resemble the look of a airport. It was probably a very convenient service for the jet setters of the 1960s, but it was eventually discontinued. The hotel has obviously changed a lot over the years, but they have kept one room (606) in its original design, which also happens to be available to stay in if you want to experience a blast from the past.